Calling every country fan!! You’re not gonna want to miss The Summer Plays Tour!! 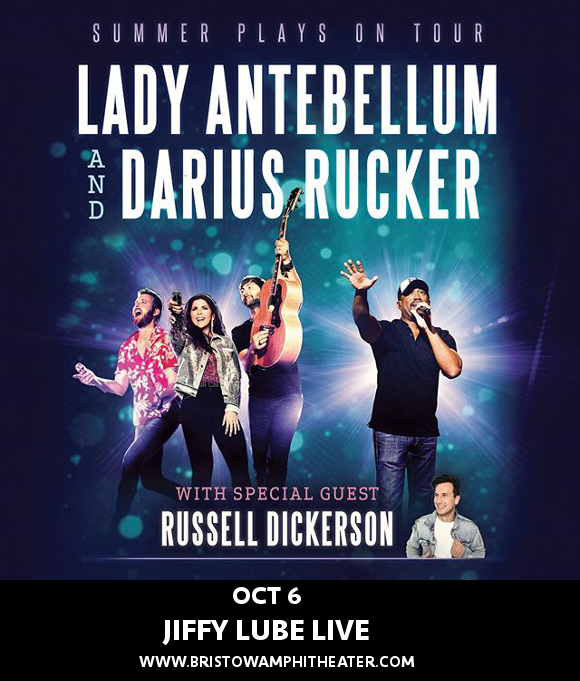 That’s right, Lady Antebellum are back on tour, and what’s more, it’s a co-headlining jaunt with Darius Rucker, featuring full sets from both acts in addition to some very special songs shared onstage! With support from newcomer and emerging star Russell Dickerson, they’re on their way to the Jiffy Lube Live on Saturday 6th October 2018. DON’T miss your chance to attend this exceptional concert – book your tickets NOW while you still have the opportunity! Way back in 2011, Lady Antebellum and Darius Rucker first joined forces when the solo country artist opened for the band on their 2011 tour. Then, in 2013, the two acts collaborated on Darius Rucker’s cover of “Wagon Wheel,” which hit number 1. Darius Rucker also collaborated with Charles Kelley in the track “Straight To Hell,” from his recent release “When Was The Last Time”! There couldn’t be any two better acts to join one another on tour!! Get your tickets NOW and experience it all for yourself! !